Popular Japanese snack brand Pocky is releasing a special flavor especially for Tokyo that’s steeped in tradition and history. This new ‘Tokyo Amazake’ flavor is based on its traditional beverage made using fermented rice. “Amazake” literally translates to “sweet sake” and is usually served hot during the winter season. In recent times, however, the drink has become popular as a health beverage. The drink contains little to no alcohol, with nutritional benefits believed to stem from its fermented ingredients. 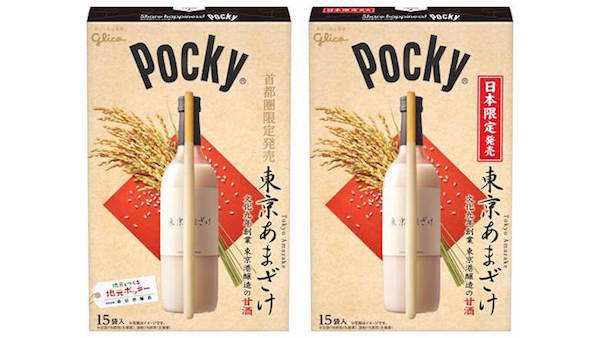 For this regional release, Pocky has partnered with Tokyo Port Brewery, which has a presence in the 23 wards of Tokyo and manufactures its products using Tokyo rice as well as water. Parent company Glico hopes to spotlight the brewery through this release and pique fans’ interest in traditional sake making by introducing ‘Tokyo Amazake’, which is said to offer a mellow aroma and flavor. Starting 5 February, ‘Tokyo Amazake’ will be released across the Japanese city with every box containing 15 sticks, each individually wrapped.